I was looking for 10 people for a program I am running, but in the last week almost 400 have contacted me! I can not speak to everyone individually but I do want to help you. I decided to run this webinar to give you the process I am sharing in detail with the people who join me on my program. What will this webinar give me? The coaching has really helped me with my direction and approach to life and work. I have enjoyed gaining new understanding on how the mind works. The results in this case more than justify the time and money spent, and working together was a pleasure, so I highly recommend working with Nathaniel. 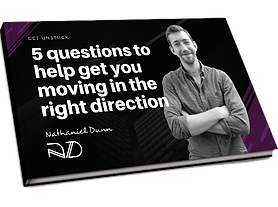 I still hit barriers and roadblocks on my way to getting there, and my sessions with Nath help me see them so much clearer so I can get past them.